Adolf Hitler was found guilty of taking part in the Beer Hall Putsch in 1923 he sentenced to five years in prison. Hitler was sent to Landsberg Castle in Munich to serve his prison sentence. He was treated well and was allowed to walk in the castle grounds, wear his own clothes and receive gifts. Officially there were restrictions on visitors but this did not apply to Hitler, and a steady flow of friends, party members and journalists spent long spells with him. While in Landsberg History read a lot of books. Most of these dealt with German history and political philosophy. Later he was to describe his spell in prison as a "free education at the state's expense." One writer who influenced Hitler while in prison was Henry Ford, the American car-manufacturer. Hitler read Ford's autobiography, My Life and Work, and a book of his called The International Jew. In the latter Ford claimed that there was a Jewish conspiracy to take over the world. Ford argued: "The Jew is a race that has no civilization to point to no aspiring religion... no great achievements in any realm... We meet the Jew everywhere where there is no power. And that is where the Jew so habitually... gravitate to the highest places? Who puts him there? What does he do there? In any country, where the Jewish question has come to the forefront as a vital issue, you will discover that the principal cause is the outworking of the Jewish genius to achieve the power of control. Here in the United States is the fact of this remarkable minority attaining in fifty years a degree of control that would be impossible to a ten times larger group of any other race... The finances of the world are in the control of Jews; their decisions and devices are themselves our economic laws." Both Hitler and Ford believed in the existence of a Jewish conspiracy - that the Jews had a plan to destroy the Gentile world and then take it over through the power of an international super-government. This sort of plan had been described in detail in The Protocols of the Learned Elders of Zion, that had been published in Russia in 1903. It is believed that the man behind the forgery was Pyotr Ivanovich Rachkovsky, the head of the Paris section of Okhrana. It is argued he commissioned his agent, Matvei Golovinski, to produce the forgery. The plan was to present reformers in Russia, as part of a powerful global Jewish conspiracy and fomented anti-Semitism to deflect public attention from Russia's growing social problems. This was reinforced when several leaders of the 1905 Russian Revolution, such as Leon Trotsky, were Jews. Norman Cohn, the author of Warrant for Genocide: The Myth of the Jewish World-Conspiracy (1966) has argued that the book played an important role in persuading fascists to seek the massacre of the Jewish people. Max Amnan, his business manager, proposed that Hitler should spend his time in prison writing his autobiography. Hitler, who had never fully mastered writing, was at first not keen on the idea. However, he agreed when it was suggested that he should dictate his thoughts to a ghostwriter. The prison authorities surprisingly agreed that Hitler's chauffeur, Emil Maurice, could live in the prison to carry out this task. Maurice, whose main talent was as a street fighter, was a poor writer and the job was eventually taken over by Rudolf Hess, a student at Munich University. Hess made a valiant attempt at turning Hitler's spoken ideas into prose. However, the book that Hitler wrote in prison was repetitive, confused, turgid and therefore, extremely difficult to read. In his writing, Hitler was unable to use the passionate voice and dramatic bodily gestures which he had used so effectively in his speeches, to convey his message. The book was originally entitled Four Years of Struggle against Lies, Stupidity, and Cowardice. Hitler's publisher reduced it to My Struggle (Mein Kampf). The book is a mixture of autobiography, political ideas and an explanation of the techniques of propaganda. The autobiographical details in Mein Kampf are often inaccurate, and the main purpose of this part of the book appears to be to provide a positive image of Hitler. For example, when Hitler was living a life of leisure in Vienna he claims he was working hard as a labourer. In Mein Kampf Hitler outlined his political philosophy. He argued that the German (he wrongly described them as the Aryan race) was superior to all others. "Every manifestation of human culture, every product of art, science and technical skill, which we see before our eyes today, is almost exclusively the product of Aryan creative power." Dietrich Eckart, who spent time with Hitler at Landsberg Castle specifically mentioned that The International Jew was a source of inspiration for the Nazi leader. The book was originally entitled Four Years of Struggle against Lies, Stupidity, and Cowardice. Hitler's publisher reduced it to My Struggle (Mein Kampf). The book is a mixture of autobiography, political ideas and an explanation of the techniques of propaganda. The autobiographical details in Mein Kampf are often inaccurate, and the main purpose of this part of the book appears to be to provide a positive image of Hitler. For example, when Hitler was living a life of leisure in Vienna he claims he was working hard as a labourer. Alan Bullock, the author of Hitler: A Study in Tyranny (1962), commented: "He was eager to prove that he too, even though he had never been to university and had left school without a certificate, had read and thought deeply... It is this thwarted intellectual ambition, the desire to make people take thwarted intellectual ambition, the desire to make people take him seriously as an original thinker, which accounts for the pretentiousness of the style, the use of long words and constant repetitions, all the tricks of a half-educated man seeking to give weight to his words." Hitler praises Henry Ford in Mein Kampf. "It is Jews who govern the Stock Exchange forces of the American union. Every year makes them more and more the controlling masters of the producers in a nation of one hundred and twenty millions; only a single great man, Ford, to their fury, still maintains full independence." James Pool, the author of Who Financed Hitler: The Secret Funding of Hitler's Rise to Power (1979) has pointed out: Not only did Hitler specifically praise Henry Ford in Mein Kampf, but many of Hitler's ideas were also a direct reflection of Ford's racist philosophy. There is a great similarity between The International Jew and Hitler's Mein Kampf, and some passages are so identical that it has been said Hitler copies directly from Ford's publication. 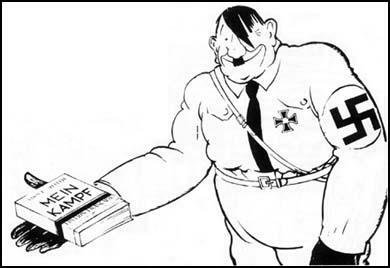 Hitler also read Ford's autobiography, My Life and Work, which was published in 1922 and was a best seller in Germany, as well as Ford's book entitled Today and Tomorrow. There can be no doubt as to the influence of Henry Ford's ideas on Hitler." Hitler warned that the Aryan's superiority was being threatened by intermarriage. If this happened world civilization would decline: "On this planet of ours human culture and civilization are indissolubly bound up with the presence of the Aryan. If he should be exterminated or subjugated, then the dark shroud of a new barbarian era would enfold the earth." Although other races would resist this process, the Aryan race had a duty to control the world. This would be difficult and force would have to be used, but it could be done. To support this view he gave the example of how the British Empire had controlled a quarter of the world by being well-organised and having well-timed soldiers and sailors. Adolf Hitler believed that Aryan superiority was being threatened particularly by the Jewish race who, he argued, were lazy and had contributed little to world civilization. (Hitler ignored the fact that some of his favourite composers and musicians were Jewish). He claimed that the "Jewish youth lies in wait for hours on end satanically glaring at and spying on the unconscious girl whom he plans to seduce, adulterating her blood with the ultimate idea of bastardizing the white race which they hate and thus lowering its cultural and political level so that the Jew might dominate." Adolf Hitler argued that the Jews were involved with Communists in a joint conspiracy to take over the world. Like Henry Ford, Hitler claimed that 75% of all Communists were Jews. Hitler argued that the combination of Jews and Marxists had already been successful in Russia and now threatened the rest of Europe. He argued that the communist revolution was an act of revenge that attempted to disguise the inferiority of the Jews. This is not supported by the facts. At the time of the Russian Revolution there were only seven million Jews among the total Russian population of 136 million. Although police statistics showed the ratio of Jews participating in the revolutionary movement to the total Jewish population was six times that of the other nationalities in Russia, they were no way near the figures suggested by Hitler and Ford. Lenin admitted that "Jews provided a particularly high percentage of leaders of the revolutionary movement". He explained this by arguing "to their credit that today Jews provide a relatively high percentage of representatives of internationalism compared with other nations." Of the 350 delegates at the Social Democratic Party in London in 1903, 25 out of 55 delegates were Jews. Of the 350 delegates in the 1907 congress, nearly a third were Jews. However, an important point which the anti-Semites overlooked is that of the Jewish delegates supported the Mensheviks, whereas only 10% supported the Bolsheviks, who led the revolution in 1917. According to a party census carried out in 1922, Jews made up 7.1% of members who had joined before the revolution. Jewish leaders of the revolutionary period, Leon Trotsky, Gregory Zinoviev, Lev Kamenev, Karl Radek, Grigori Sokolnikov and Genrikh Yagoda were all purged by Joseph Stalin in the 1930s. To achieve this expansion in the East and to win back land lost during the First World War, Adolf Hitler claimed that it might be necessary to form an alliance with Britain and Italy. An alliance with Britain was vitally important because it would prevent Germany fighting a war in the East and West at the same time. According to James Douglas-Hamilton, the author of Motive for a Mission (1979) Karl Haushofer provided "Hitler with a formula and certain well-turned phrases which could be adapted, and which at a later stage suited the Nazis perfectly". Haushofer had developed the theory that the state is a biological organism which grows or contracts, and that in the struggle for space the strong countries take land from the weak. (1) Adolf Hitler was in hospital recovering from a chlorine gas attack when he heard that the German government had surrendered. Everything went black before my eyes; I tottered and groped my way back to the ward, threw myself on my bunk, and dug my burning head into my blanket and pillow. So it had all been in vain. In vain all the sacrifices and privations; in vain the hours in which, with mortal fear clutching at our hearts, we nevertheless did our duty; in vain the death of two million who died. Had they died for this? Did all this happen only so that a gang of wretched criminals could lay hands on the Fatherland. I knew that all was lost. Only fools, liars and criminals could hope for mercy from the enemy. In these nights hatred grew in me, hatred for those responsible for this deed. Miserable and degenerate criminals! The more I tried to achieve clarity on the monstrous events in this hour, the more the shame of indignation and disgrace burned my brow. The masses find it difficult to understand politics, their intelligence is small. Therefore all effective propaganda must be limited to a very few points. The masses will only remember only the simplest ideas repeated a thousand times over. If I approach the masses with reasoned arguments, they will not understand me. In the mass meeting, their reasoning power is paralyzed. What I say is like an order given under hypnosis. The Jewish youth lies in wait for hours on end spying on the unsuspicious German girl he plans to seduce. He wants to contaminate her blood and remove her from the bosom of her own people. The Jew hates the white race and wants to lower its cultural level so that the Jews might dominate. The whole organization of education, and training which the People's State is to build up must take as its crowning task the work of instilling into the hearts and brains of the youth entrusted to it the racial instinct and understanding of the racial idea. No boy or girl must leave school without having attained a clear insight into the meaning of racial purity and the importance of maintaining the racial blood unadulterated. Thus the first indispensable condition for the preservation of our race will have been established and thus the future cultural progress of our people will be assured. A reform of particular importance is that which ought to take place in the present methods of teaching history. Scarcely any other people are made to study as much of history as the Germans, and scarcely any other people make such a bad use of their historical knowledge. If politics means history in the making, then our way of teaching history stands condemned by the way we have conducted our politics. But there would be no point in bewailing the lamentable results of our political conduct unless one is now determined to give our people a better political education. In 99 out of 100 cases the results of our present teaching of history are deplorable. Usually only a few dates, years of birth and names, remain in the memory, while a knowledge of the main and clearly defined lines of historical development is completely lacking. The essential features which are of real significance are not taught. It is left to the more or less bright intelligence of the individual to discover the inner motivating urge amid the mass of dates and chronological succession of events. The subject matter of our historical teaching must be curtailed. The chief value of that teaching is to make the principal lines of historical development understood. The more our historical teaching is limited to this task, the more we may hope that it will turn out subsequently to be of advantage to the individual and, through the individual, to the community as a whole. For history must not be studied merely with a view to knowing what happened in the past but as a guide for the future, and to teach us what policy would be the best to follow for the preservation of our own people. There is one reason which would seem to rule out the possibility of an alignment between German and Soviet Russia. It's this: Hitler's goal is the occupation and annexation of a vast part of Russia. How are you going to play ball with a man who covets your house and intends to settle in it if he can, even if he has to hit you over the head with his bat? And moreover says so. Because he does in Mein Kampf, that Nazi bible which we all have to go to to divine what the Fuhrer may have in his mind next. Hitler in Mem Kampf says very plainly that Germany will only be a great nation when it acquires a much larger territory in Europe. From where is that territory to come? Hitler very obligingly gives us the answer. It is: From Russia. A second reason is that if Hitler were to make a deal with Russia, the Japanese alliance, or whatever you call their present understanding, falls through automatically. Now the strange tie-up between Japan and Germany is not so strange as it seems, if we look into it for a moment. It's - valuable to Germany first as a part of a general threat to Britain and France - and to a lesser extent, the U.S. - in the East. Secondly, if and when Russia is to be conquered, it confronts Russia with a war on two greatly distant fronts, thus making Germany's job of conquering European Russia much easier. This second point is also the reason for Tokyo's friendship with Berlin - that is, if Japan is to get the Russian maritime provinces as well as Mongolia and a big slice of Siberia, Germany's military effort on the Western Front is absolutely necessary. Unless Japan ruins itself as a Great Power in China, and thus can no longer threaten the three Democracies in the Far East, there is little evidence that Hitler will ditch Tokyo. Along the path that he has apparently chosen, it is too valuable an ally. (6) Hans Scholl, Sophie Scholl, Christoph Probst, Kurt Huber, Alexander Schmorell and Willi Graf were executed in 1943 for publishing and distributing leaflets hostile to the government of Adolf Hitler. This is an extract from the second White Rose leaflet published in 1942. It is impossible to engage in intellectual discourse with National Socialism because it is not an intellectually defensible program. It is false to speak of a National Socialist philosophy, for if there were such an entity, one would have to try by means of analysis and discussion either to prove its validity or to combat it. In actuality, however, we face a totally different situation. At its very inception this movement depended on the deception and betrayal of one's fellow man; even at that time it was inwardly corrupt and could support itself only by constant lies. After all, Hitler states in an early edition of "his" book (a book written in the worst German I have ever read, in spite of the fact that it has been elevated to the position of the Bible in this nation of poets and thinkers); "It is unbelievable, to what extent one must betray a people in order to rule." We do not want to discuss here the question of the Jews, no do we want in this leaflet to compose a defence or apology. No, only by way of example do we want to cite the fact that since the conquest of Poland three hundred thousand Jews have been murdered in this country in the most bestial way. Here we see the most frightful crime against human dignity, a crime that is unparalleled in the whole of history. Next to Gearing, Hitler is a model of virtue. When he became chancellor of the Reich he renounced the usual salary with a noble gesture. I do not know whether this gesture has been followed through. Nevertheless, Hitler is the richest man in Germany. It is true that he has not grown rich on public revenues. His whole fortune is due to his pen. Indeed, Hitler is a man of letters. He is, if not the most read, at least the most purchased, of all men of letters in the world. 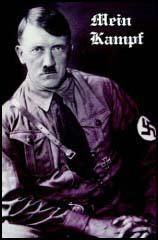 Mein Kampf has reached a sale of seven or eight million copies. By a decision of the Reich ministry of the interior this book is distributed at the cost of the municipalities to all newlywed couples.